Pete Hall is now a fully qualified service technician at SLM Toyota Uckfield. Here at SLM Toyota Uckfield we are very pleased to be able to announce that Pete Hall has now qualified as a 'Service-Tech'. To achieve this status Pete has worked extremely hard, completing various practical and academic assessments over many months. The hard work has all been worth it and he is now looking forward to attaining the 'Pro-Tech' qualification, which involves more in-depth study about all aspects of the role. Pictured above is Aftersales Manager Vince Riseborough handing over the certificate to Pete. 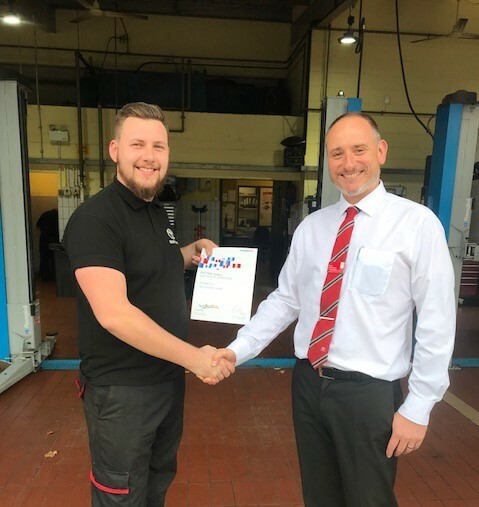 About his achievement, he commented "I would like to congratulate Peter on achieving his 'Service-tech' status with Toyota, it takes hard work and commitment to achieve this qualification. Well done Pete." Everyone at the dealership is very proud of Pete for completing the course and we would like to wish him the best of luck as he begins working towards the next level of his qualification!